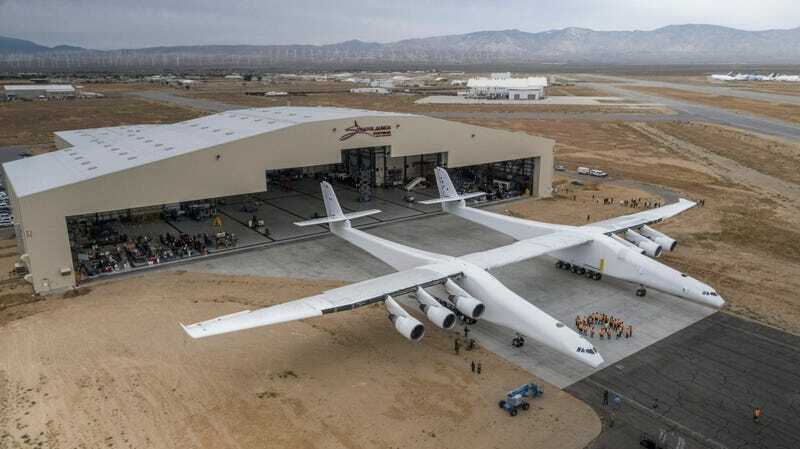 The ultra-wide double-plus-big Stratolaunch dual-fuselage airplane took its first flight test Saturday morning from a desert runway in Mojave, California. The plane weighs half a million pounds, and is intended to be a launching mothership for space rockets. The intent of this plane is to strap a small rocket between the two fuselage to fly it up to near the edge of the stratosphere, at over 35,000 feet. In this way the rocket will not need the expensive and fuel laden stages to get its cargo into orbit (below). This plane intends to serve the same purpose as SpaceX’s Falcon Heavy rockets, but ostensibly to more efficient ends. 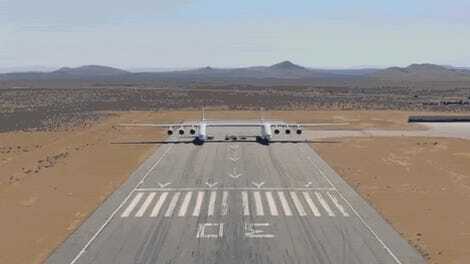 Regardless of its purpose, the Stratolauncher is officially the largest airplane humanity has ever put up in the air. It’s got a 385 foot wingspan. It’s cliche to describe something this way, but this plane’s wingspan is literally longer than a football field, including the end zones. It’s a big boy. And it flies. Astonishing.